The art of Adriano Manocchia, a painter you have come to respect as a master of sporting art and contemporary realism, is the subject of a collectable art book entitled Water, Sky & Time. This project took years of work and preparation to complete, but the end results exceeded all of our expectations. We would like to invite you to explore with us this fascinating journey into the creative life of this beloved artist through the pages of his book. Through the last thirty years, Adriano's passion for angling and the outdoors has led him to paint scenes from the Catskills to Colorado and from far off British Columbia to the Bahamas. 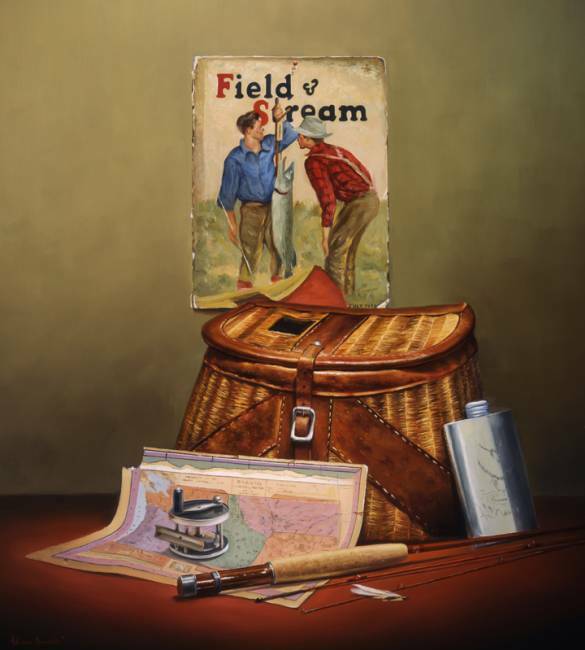 Through angling and hunting images, golf scenes, landscapes, wildlife and still life paintings, he has been able to convey the magic of his art to his collectors worldwide. 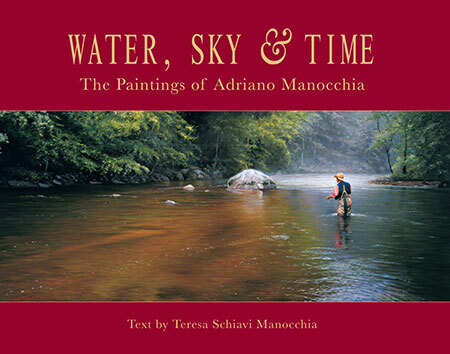 This hardcover book offers a 30-year retrospective of Adriano's most notable paintings with an emphasis on waterscapes and still-lives as well as a fascinating glimpse into his creative process as seen through the eyes of his wife Teresa Schiavi Manocchia whose numerous writings and featured articles have been published in prestigious European and American publications for the last thirty years. We are truly grateful that professionals in both the fine art and sporting art worlds have embraced Water, Sky & Time. The introduction is written by James R. Babb, editor of Gray's Sporting Journal, the foreword by Chuck Wechsler, publisher and editor of Sporting Classics Magazine and the biographical sketch by John F. Apgar, director emeritus at J.N. Bartfield Galleries. "Adriano paints archetypal scenes in magical colors," says James Babb. "Not the self-consciously accurate blues and blacks and reds and greens of a journalist relating reality but the deeper, purer, wilder colors imprinted on our minds by experience. ...Magic is exactly what I feel when looking into an Adriano Manocchia painting." This ability to capture the essence of a scene in his paintings is echoed by Chuck Wechsler: "Adriano knows and loves wild waters—you can see it in every one of his paintings. ...[His] penchant for dramatic realism is likewise apparent in his still lifes. ...It has been said that art is to be liked and lived with—and I for one can think of no finer art that I'd like to live with than the paintings of this celebrated artist." John F. Apgar notes instead how Adriano has earned a well-deserved reputation in the contemporary fine art field: "Adriano Manocchia has created a niche all his own in American art, which is being well received by critics. His gift of conveying the sky's and the water's magic through his paintings is making a meaningful contribution to today's art scene." His wife, Teresa, who often accompanies him on his journeys to find the perfect landscape, chronicles the sensitivity of Adriano's artistic soul that is at the heart of his paintings: "Before reaching for his camera, Adriano takes a moment to absorb and be absorbed by his surroundings. His emotions, his innermost response to the moment and the experience are what will ultimately surface in his paintings. The photos will just serve as a trigger to reawaken these impressions. He works furiously, moving rapidly from one spot to the next, racing against time. A buffalo crosses the river as an added bonus. This morning the muses are definitely smiling down on him."